'The Great Escape'...Private Pool...Beach cottage...Steps to Beach! Our charming Destin Florida Vacation Home is a three-bedroom cottage located in Destin's Crystal Beach community. Conveniently located just one and one-half blocks from the pristine Emerald Coast beach. It is an easy walk and there are no busy streets to cross. With 20-foot high vaulted ceilings and a retractable wall of glass overlooking our private pool, our home allows the outside to become part of your everyday living environment. Every room contains a ceiling fan and a 6-foot privacy fence surrounds the pool. Children and large families are welcome, but you may just want this Destin cottage all to yourself. Named “The Great Escape”, you will find this vacation home to be a wonderful retreat for families and/or couples. The contemporary decor and open floor plan allow you to relax in the comfort of our vacation home. The location is convenient to Destin Commons, the Fort Walton Airport, Big Kahuna Water Theme Park, and various other local Destin attractions. This absolutely perfect vacation home comes with a King bed in the master, a king size bed in the second bedroom and 2 sets of twin bunk beds in the third bedroom, which is perfectly suited for children! You also have a comfy queen sleeper sofa in the living room, should you need it. You will find the kitchen to have everything you need with all the comforts of home. The floor plan is open and airy, with a spacious feeling. Don’t forget about your private pool and patio area complete with gas grill and patio table and chairs. It's a wonderful escape from the beach. But, the Destin Florida beaches are the BEST!!! Your wonderful Destin Florida vacation can start with a day with shopping or golf, hit the beach or sit by the pool, you can complete your day with a fabulous meal. Whether you are in the mood to dress up and go out, or grill out by the pool, it is your choice. Our home is centrally located to a wide-range of activities for all ages. 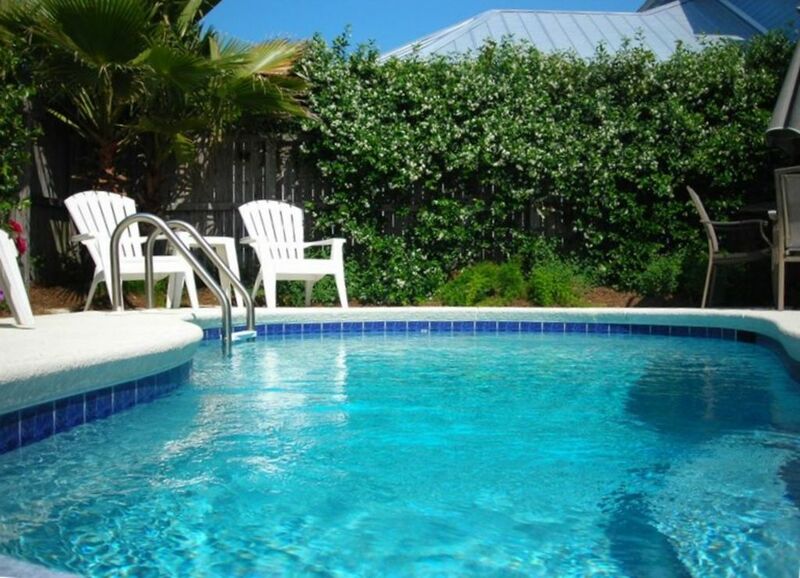 We are confident you will enjoy your 'Great Escape' Destin vacation as much as we do! Welcome to The Great Escape! This is our home away from home. We built this house in 1998 when we were living in Boston, MA and needed a place to 'escape' to. We found Destin. Most of our family and friends had not heard of Destin and thought we crazy to be building a vacation home so far away. They also thought it would be impossible to rent and manage from so far away. Well, 17 successful years later we're still at it and loving it. We get down to Destin a few times every year; although it is never enough and the visits are too short! Destin is like an addiction! We just want to go back for more. And, the more we talk to people, we learn we're not the only ones who feel this way. People have been going to Destin year after year - for 15-20 years or more! We love Destin, the people, the incredible beaches and the wonderful memories we build with each trip. We've had over 100 families stay at the Great Escape and many return each year. As a mother of 13 year old twins and a nine year old, our lives are extremely busy and I look forward to our weekly vacation each year. We strive to make The Great Escape a wonderful, relaxing experience for all of our guests and are sure you will enjoy it, and Destin, as much as we do. We look forward to having you visit! The Great Escape is a retreat from your everyday life. It is equipped with everything you need - you just have to show up and relax! We are within walking distance to shopping, restaurants and of course the beach! The private back yard allows you to entertain friends or enjoy the peace. You choose! Coffee in your jammies by your own private pool or cocktails at night - the choice is yours! Our home is just that - a home. We have decorated as a home and it comes equipped with everything you will need to enjoy your vacation. We provide all linens, inlcuding beach towels! We also have pool toys and beach toys for you to use. If you're traveling with small kids, leave the pack 'n play and booster seat at home - we've got both at our place for you to use! Beautiful wood dining table and chairs. TV's in every room; all amenities from home including blender, iron and hair dryer! Our home is conveniently located in the popular community of Crystal Beach. It is centrally located 4 miles east of Destin Harbour, and just south of Destin Commons.